The battle of Gog and Magog is the major Bible prophecy of our day. In other words I think that we will see the Magog invasion begin very soon. Magog was a man. He was one of Noah’s grandsons. There are several places in the Bible that talk about an invasion against Israel that are led by Magog. I don’t think that there is only one battle of Gog and Magog. I think that the Bible references three separate invasions. All of these invasions are led by Magog the leader of Turkey! Ezekiel chapter 38 describes the first battle of Gog and Magog. All of the people described in Ezekiel chapter 38 are now in place for this battle to begin! The battle of Gog and Magog described in Ezekiel chapter 38 is a loud wake up call announcing that the end of the church age is near, and that the time of Tribulation for Israel and the whole earth is at hand. Bible prophecy teachers say that Magog in the Ezekiel 38 prophecy refers to Russia. But from my house I can’t see Russia! That view of the Magog prophecy came about by transcribing “chief” (or the Hebrew “rosh”) to mean Russia. Transposing Hebrew words into English phonetic equivalents is not proper Bible prophecy interpretation technique. That technique is not used elsewhere to interpret Bible prophecy. Rosh means first or primary. Magog is a man who settled in the land of modern day Turkey. Eze 38:1-6 And the word of the LORD came unto me, saying, 2 Son of man, set thy face against Gog, the land of Magog, the chief prince of Meshech and Tubal, and prophesy against him, 3 And say, Thus saith the Lord GOD; Behold, I am against thee, O Gog, the chief prince of Meshech and Tubal: 4 And I will turn thee back, and put hooks into thy jaws, and I will bring thee forth, and all thine army, horses and horsemen, all of them clothed with all sorts of armour, even a great company with bucklers and shields, all of them handling swords: 5 Persia, Ethiopia, and Libya with them; all of them with shield and helmet: 6 Gomer, and all his bands; the house of Togarmah of the north quarters, and all his bands: and many people with thee. We scratch our heads over this section of Bible prophecy because so many of these names are unfamiliar. Please note that we are talking about the land of Magog in verse two. As we will see Magog is a man. Notice that there are three names that are very familiar. Persia, Ethiopia, and Libya. They are today’s Iran, Ethiopia (includes Sudan), and Libya. Wow, we are half way done! This isn’t the first passage where Magog, Meshech, Tubal, Gomer, and Togarmah are found. Let’s look at Genesis 10:1-3. Jeepers, all those weird names are listed in that short passage! Magog, Meshech, Tubal, Gomer, and Togarmah are people. As a matter of fact they are relatives. Magog, Meshech, Tubal and Gomer are brothers. Togarmah is Gomer’s son. They are among the first families to resettle the world after the devastation of Noah’s flood. They all settled together in today’s Turkey. See the “Map of Gog” below. Verse 2 tells us that Gog is the LAND of Magog. Magog is the “chief prince” (or most prominent) of his brothers, Meshech and Tubal. So Noah had a son named Japheth who had a son named Magog who settled Turkey. Gog is a shortened version of Magog. Gog is the LAND where Magog and his brothers settled. You now know more than your pastor! Eze 38:4-6 And I will turn thee back, and put hooks into thy jaws, and I will bring thee forth, and all thine army, horses and horsemen, all of them clothed with all sorts of armour, even a great company with bucklers and shields, all of them handling swords: 5 Persia, Ethiopia, and Libya with them; all of them with shield and helmet: 6 Gomer, and all his bands; the house of Togarmah of the north quarters, and all his bands: and many people with thee. Just as we were getting to know these guys we learn that they are going to lead an attack on Israel (Eze 38:8 & 16). God himself is going to pull them into battle array. In today’s terms we understand that Turkey will initiate a battle against Israel. This is the battle of Gog and Magog. Turkey will be joined by Iran, Ethiopia (Cush, includes Sudan), and Libya. Remember: Gomer and Togarmah are among the families who settled in Turkey. They lived in the LAND of Gog along with Magog. Sheba and Dedan are brothers descended from Noah through Ham’s son Cush (Ethiopia/Sudan). They settled the area of the Persian Gulf. Sheba and Dedan specifically refer to the United Arab Emirates and Saudi Arabia. It is widely taught by prophecy buffs that “Tarshish, with all the young lions thereof” refers to European countries. Some prophecy students think that the merchants of Tarshish sailed from Asia Minor (Turkey) to Spain. They may have sailed there but I’m not so sure that Europe is represented here. 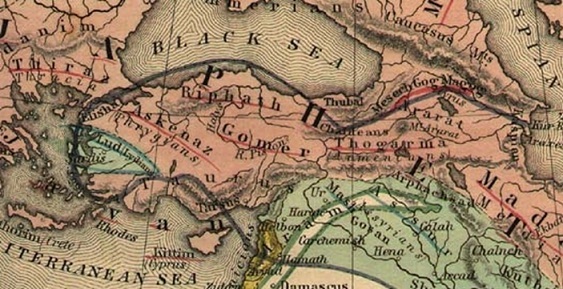 Tarsus (perhaps Tarshish) can be found on the “Map of Gog”. Tarsus is still a town today! There are several biblical references to Tarshish. Tarshish was the nephew of Magog and his brothers (1Ch 1:7). Tarshish was a seaport far from Israel (2Ch 9:21). Tarshish is contrasted with Saudi Arabia as being opposite shipping directions (Psa 72:10-11). 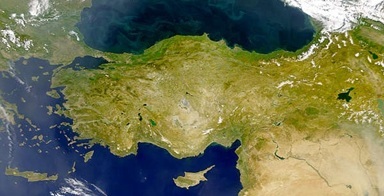 Tarshish is listed among other provinces of Asia Minor (Isa 66:19). Tarshish is also listed as a Mede or Persian prince in Esther 1:14. To be brief I think that the merchants of Tarshish come from the Mediterranean port city of Tyre in Lebanon. Please read my commentary titled “Who were the merchants of Tarshish” in my eBook “Halfway to Armageddon”. Notice that “Sheba, and Dedan, and the merchants of Tarshish, with all the young lions (neighboring villages) thereof” aren’t joined in the battle in Eze 38:13. Instead, they are incessantly asking what kind of riches the Magog marauders intend to take from Israel?! We can at least know that Saudi Arabia and other nations will make this comment about the Magog Marauders, “Art thou come to take a spoil?” Today every nation described in Ezekiel 38:5 is fighting in Syria. It may be that the Magog invasion comes from there! Notice that God calls “for a sword against him (Magog) throughout all my mountains” (Eze 38:21).The major mountainous regions in Israel are across the northern part of the nation, also along the northern center half (Judea and Samaria), and in the Southern District in the Negev desert (see topographic map below). Eze 38:19-22 For in my jealousy and in the fire of my wrath have I spoken, Surely in that day there shall be a great shaking in the land of Israel; 20 So that the fishes of the sea, and the fowls of the heaven, and the beasts of the field, and all creeping things that creep upon the earth, and all the men that are upon the face of the earth, shall shake at my presence, and the mountains shall be thrown down, and the steep places shall fall, and every wall shall fall to the ground. 21 And I will call for a sword against him throughout all my mountains, saith the Lord GOD: every man’s sword shall be against his brother. 22 And I will plead against him with pestilence and with blood; and I will rain upon him, and upon his bands, and upon the many people that are with him, an overflowing rain, and great hailstones, fire, and brimstone. Happily these armies are not successful in their attack on Israel. As a matter of fact they are systematically undone. God causes every man’s sword to be against his brother. God uses the forces of nature against these armies; such as an enormous earthquake, pestilence and blood, and overflowing rain, great hailstones, fire, and brimstone. This battle may occur prior to “the Great Tribulation”. It may be that the supernatural derision that these armies encounter prompts a “peace” agreement. The signing of a seven year “peace” contract with Israel marks the beginning of “the seven year “Tribulation” (Dan 9:27). God “pleads” with the armies. He is trying to show them that the god of Israel is the one true God. Perhaps even at this dark hour some will look up and glorify God and be saved. Some of Ezekiel 38 may pertain to the battle of Armageddon in the valley of Jehoshaphat (lit. means Jehovah Judged; also called the valley of Jezreel), because it happens in the mountains of Israel (Eze 38:21). The blood will flow into the valley of Megiddo down to the Dead Sea. My leaning though is that the first battle of Gog and Magog will happen soon. I think that the second battle of Gog and Magog described in Ezekiel chapter 39 is in fact the same as the battle of Armageddon. Note: there are other battle fronts in end time Bible prophecy. Specifically, coming from Edom, Moab, and Ammon (all present day Jordan). Christ will enter Israel from Bozrah in Edom with his garments stained red with the blood of Israel’s enemies (Isa 63:1). Edom was the country of Esau, Jacob’s brother. Bozrah is the Ancient Capital of Edom (Idumaea). Edom had a rough history being subdued regularly. Bozrah was finally leveled. It is still on the map today but it is desolate. I think that the battle of “Gog and Magog” described in Ezekiel chapter 38 is a battle that happens before the tribulation. It also happens before the battle of Armageddon. The way that world events are unfolding leads me to think that the battle of “Gog and Magog” may start very soon. Turkey will lead Iran, Libya, and Ethiopia-Sudan in an invasion into Israel. Do not worry! God will fight for Israel! He will plead with the invading nations using the forces of nature. Ezekiel chapter 38 describes a battle that happens before the seven year Tribulation period. Ezekiel chapter 39 describes a battle that happens at the end of the Tribulation period. Revelation describes another battle of Gog and Magog. This battle is similar to the original battle called “Gog and Magog”. It happens at the end of Jesus’ first 1000 year reign on earth. So the battles are separated by 1000 years. Bible prophecy often refers to two similar but distinct events. They are usually separated by time. Rev 20:7-10 And when the thousand years are expired, Satan shall be loosed out of his prison, 8 And shall go out to deceive the nations which are in the four quarters of the earth, Gog and Magog, to gather them together to battle: the number of whom is as the sand of the sea. 9 And they went up on the breadth of the earth, and compassed the camp of the saints about, and the beloved city: and fire came down from God out of heaven, and devoured them. 10 And the devil that deceived them was cast into the lake of fire and brimstone, where the beast and the false prophet are, and shall be tormented day and night for ever and ever. Revelation’s battle is called “Gog and Magog” because it is like the first battles. All battles mark the beginning of the end of an age. The first battle marks the end of the Church age and the beginning of the Tribulation period on earth. The second battle marks the beginning of Christ’s reign on earth. The last battle marks the end of Satan’s freedom forever. The battle described in Revelation is a gathering of nations against Israel like the first battle. The battle described in Revelation involves all of the nations of the ancient world. However, the original battle of Gog and Magog involves only four primary nations (Turkey, Iran, Ethiopia [including Sudan], and Libya). The battle described in Revelation is an assault to loosen the heathen from God’s fetors like the first battle. The battle described in Revelation may be initiated by the leader of Turkey (that is: the LAND of Gog) like the first battle was. God will use the forces of nature against the invading armies in both battles. God uses an earthquake, rain, and pestilence etc. in the first battle and fire in the last battle of Gog and Magog. If I have missed anything, I will tender a heartfelt apology after the battle. Now you are ready to read Ezekiel 38-39 with great understanding. In Ezekiel 39:11, Hamongog means the “multitude of Gog”. In Ezekiel 39:16, Hamonah means simply “multitude”. So Read it already! God bless you. Dear GOD….please protect us and Israel from the Satanic Army. I have just discovered your website and WOW, you make more sense out of the scriptures than anyone I’ve read to date. I have been searching and studying these end times nations and have come to realize, before I found you, that Turkey would be prominent in these battles and have always recanted to others what the Bible says, that the anti-Christ will be an Assyrian. I do believe, after reading what is happening politically with Erdogan and Turkey seeking to be a part of the European Union, that there will be alliance formed, as the anti-Christ will arise from among them. I am so excited to find this website and I plan to start getting some of your books. I have always wondered how people got their interpretations of Gog/Magog and the other names to mean Russia. I see Putin as a force to be reckoned with and he is pulling some of those Muslim nations together, but Turkey is rising up and fast and recently I heard that Erdogan made a statement that he was now the leader of all the Muslim nations. I am trying to find that news source where I first read that, but I haven’t found it yet. That was a recent comment he made. He is very boastful as it is. Praise God we are ever so much closer to the Rapture of true Christians….every so close. Hi Victoria. Thank you for your good greetings. Good job keeping your eye on Turkey. You are correct. If Erdogan is the Antichrist then we are awfully close to the resurrection and rapture of Church age believers and also God’s wrath on earth! Then a 1,000 reign of Jesus followed by a final battle? – the rapture is nearly guaranteed to be either before, during or immediately after the 7-year tribulation correct? It can’t possibly be AFTER the 1,000 year reign? – Armageddon – Ive always had it in my head that this final, epic battle would take place close to the 7-year tribulation? The Rapture is designed to deliver Christians out of the Tribulation. So the Rapture will happen before the Tribulation or at least before the wrath of God falls upon the earth. The battle of Armageddon is named for the place where it will happen. The valley of Megiddo in northern Israel. Several epic battles have been fought there. The battle of Armageddon happens at the end of the Tribulation period. Afterwards the Antichrist and false Prophet will be thrown into the lake of fire. Satan will be bound in chains for one thousand years and then released for one last time of trouble. The difference between the battle of Armageddon and the final rebellion is that Israel will not be harmed at all in the last battle. Afterwards Satan will finally be cast into the lake of fire. An excellent, well thought out exegesis of this passage. Very informative. Thank you for the insight. I so appreciate your insight into Ezekiel 38 & 39. I do have one question: How do you explain, understand the repeated phrase that Israel is “living securely” in the land, a land of unwalled villages. It seems to me this is not true of Israel presently! In fact in the context, the phrase seems to be used when referring to the Millennial reign, for example Ezekiel 34:25- 31. Thank you for any insight into this. Hi Pam. I think that Israel is now living in peace. Re: “dwell safely” or “dwell securely” in Ezekiel 38:8. After reviewing all major concordances (Strongs, Youngs) and critical and analytical Bible commentaries, the aforementioned terms are better expressed, “dwell confidently” (despite constant threats from surrounding nations, including Hamas, Hezbolah, etc. Will we (Christians) be here to see Turkeys attack on Damascus and the Ezekiel 38 battle? Hi Donnie. Good question. I don’t know if Christians will be here to see Turkey destroy Damascus. We may be here or we may be raptured away first. Considering that Turkey is already fighting in Syria that day is near.